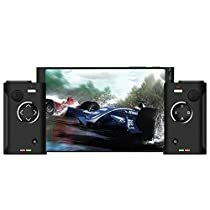 Aikun Morphus X300 is professional 3D-Glasses-Free gaming tablet,with high processing speed Octa Core ARM CortexA7 up to 2.0 GHz,and excellant GPU PowerVR SGX 544,these ensure that we can experience more wonderful 3D videos and games more easily and smoothly. The OS is Android 5.1.1,very easy to use,with massive game,music and video resouces to download. The ram is 2GB,rom is 32GB,it supports Micro SD up to 128GB. Morphus X300 supports 802.11b/g/n/a dual wifi 2.4GH&5.0GHz,bluetooth 4.0. With Morphus X300 professional wireless game controllers and mapping software,we can help you to easy to Re-Function and save profile for any game very fast by " Drag and Drop ". The camera of Morphus X300 is special and exquisite?it can rotate 180°?not only front and back again,this makes people can always get HD photo more easily. With 5200 mAH Li-Polymer rechargeable Battery,we can play music for 18 Hours,or play videos for 4 Hours,the duration is 6 hours at average. This is a very nice android tablet. Vey fast and you can downliad a lot of games and they run ok. Camera works nice and very easy to turn it. Controllers are perfect compatible and they fit as described. The best oart of this tablet is the 3d glasses free . It comes with one video but you can downliad 3d side by side from youtube and they look fantastic. I couldnt find yet a 3d gaming player for games gkassesftee and i i will steel search for it but games all run smooth and fast. Nice 3D screen, games played well, video quality was good. Controllers were a bit uncomfortable and the unit couldn't use my 128gb cards even though it states that it supports them.